"A lifetime of experience is worth sharing." Lillian Gonzalez-Pardo, M.D., professor emerita in pediatrics and neurology at the University of Kansas Medical Center, opens the preface of her memoir, "Beyond the Shores" by emphasizing the importance of recording our histories before memories fade. Her book, however, is only one way in which Pardo has shared her experience. Over the course of her medical education and academic medical career, she was often inspired by visiting professors. Pardo and her husband, Manuel P. Pardo, M.D., decided to establish a lectureship to give today's students, residents and young faculty the opportunity to be equally inspired. "As a resident, I had to present to visiting professors who were among the most well-respected in the field of neurology," she said. "It incentivizes you to be at your best. It was an influence; I was really affected by those visitors." 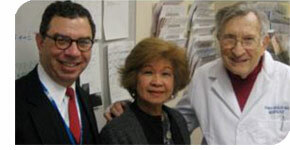 A gift from the couple established the Lillian Gonzalez-Pardo, M.D., Pediatric Neurology Lectureship at KU Med. The first lectureship, in mid-March, will feature speaker E. Steve Roach, M.D., professor of pediatrics and neurology at The Ohio State University College of Medicine. His lecture is titled "Stroke Due to Sickle Cell Disease: Lessons From Two Decades of Clinical Trials," a topic that Pardo had a hand in selecting. The first lecture was presented at the Sudler Auditorium on March 17 during the Department of Neurology Grand Rounds series with faculty, staff, students and residents from different specialties. Richard Barohn, M.D., chair of the Department of Neurology and a University Distinguished Professor, said the lectureship would enhance students’ educational experience at KU Med. "We are thrilled that Dr. Pardo and her husband, Manny, have decided to support an endowed lectureship in pediatric neurology," Barohn said. "With this support, we will be able to bring leading pediatric neurologists from throughout the United States annually to the university to interact with our students, residents and faculty. Support such as this from our alumni, staff and faculty is what makes KU Medical Center a special place."